Worried about the dark spots around the exterior areas of your home? Adding security lights to your home safety plan is worth considering. The following tips will give you an idea of your options. Have questions? 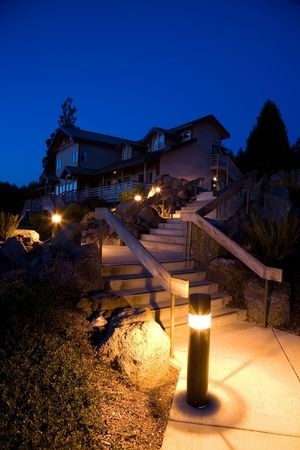 BP is happy to advise when you are ready to install security lighting around your property. Choose night-lights or sensor-based lights. While light-sensor driven security lights will stay on all night, sensor-based “motion detector” lights will only turn on when they detect motion. Night lights can generally be effective in maintaining visibility and allowing monitoring of public spaces. However, many homeowners choose motion-sensor-based lights because they can be more intimidating to an intruder. When someone approaches across a dark space, and suddenly a bright light snaps on, they can be frightened into running away. Another good tip is to position security lights on walkways such as the front walkway to a home, or a path to the side door of a home. It’s also effective to put security floodlights on paths to an outbuilding such as a garage or shed. The idea is that as intruders make their way between buildings, or in from the street, these lights will illuminate their activity. Another good option is segmented lights that independently go on across a specific space. Multiple floodlights on the front approach or side approach to the house can be more effective than a single light. They’re also harder to tamper with – which brings up an additional point – position lights high enough that they can’t be easily damaged or manipulated. These are the basics, but you have many options. Allow BP Alarm to shed some light on your modern security solutions.